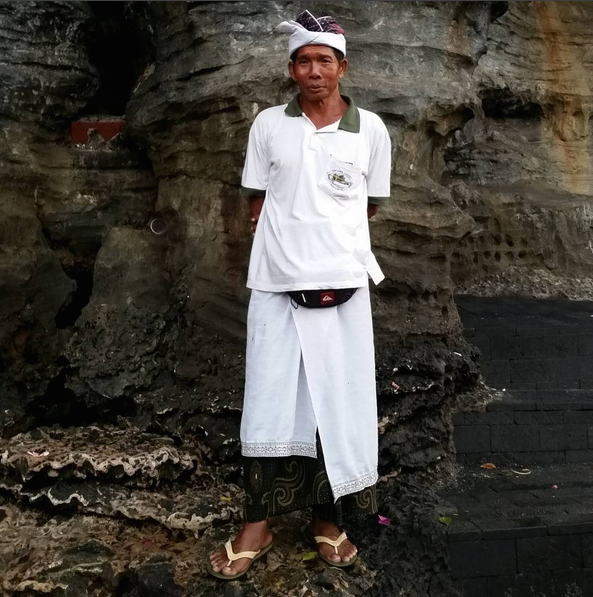 Last week, I ventured off to Bali for a little R&R and, accordingly, I must share a few photos with the highlights. 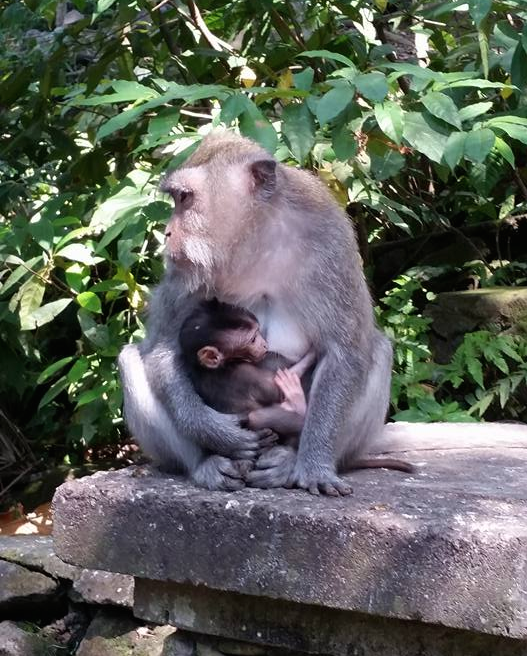 It was a whirlwind trip (just a weekend in Bali, folks), but I managed to pack in both Jimbaran Bay and Ubud and monkeys, of course, lots of devilishly cute, but don’t mess with ’em monkeys. I look forward to spending more time in this fascinating Goddess filled land of rice and Ganesha! We arrived late in the evening to gracious staff who had us beat a gong three times to announce our entrance. Although it was pitch black, the grounds were more impressive than we could imagine. After making reservations the very day we were to arrive through one of my new favorite websites for Asia, Agoda, we booked garden rooms at the Belmond Jimbaran Puri Bali for approximately $350 USD and, to our amazing surprise, they had overbooked those rooms so we were upgraded to villa rooms. And, when I say villa rooms, I mean, one bedroom villas, each with it’s own private pool and a separate sitting area with enough space for three people as the sofa was large enough to nap comfortably. Needless to say, when we each awoke to see the villas in daylight, we were blown away. 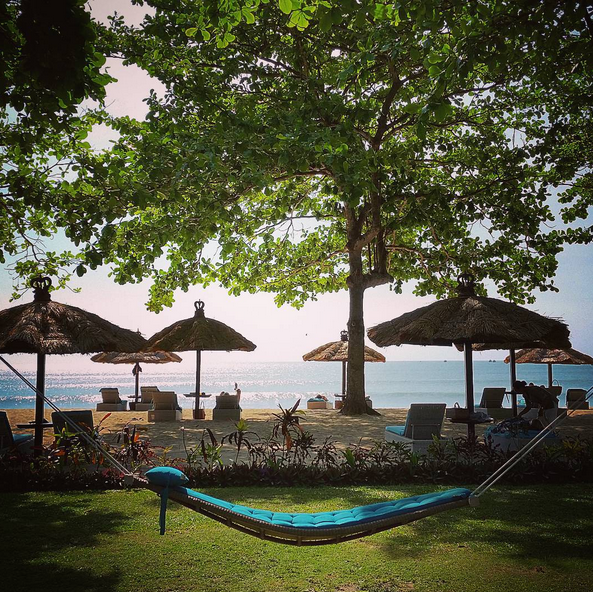 We were very close to staying at the Four Seasons or InterContinental, but Agoda showed that the Belmond Jimbaran Puri Bali had last minute availability (and a better price), so we were thrilled. 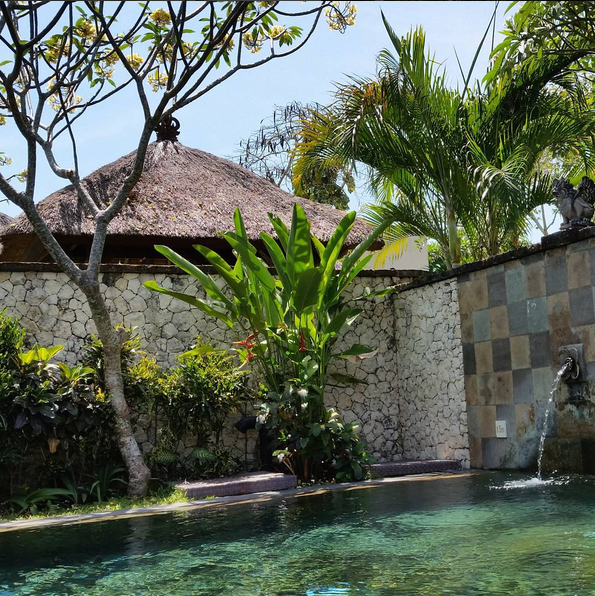 We were also keen to stay somewhere that felt authentically Balinese and this did the trick. 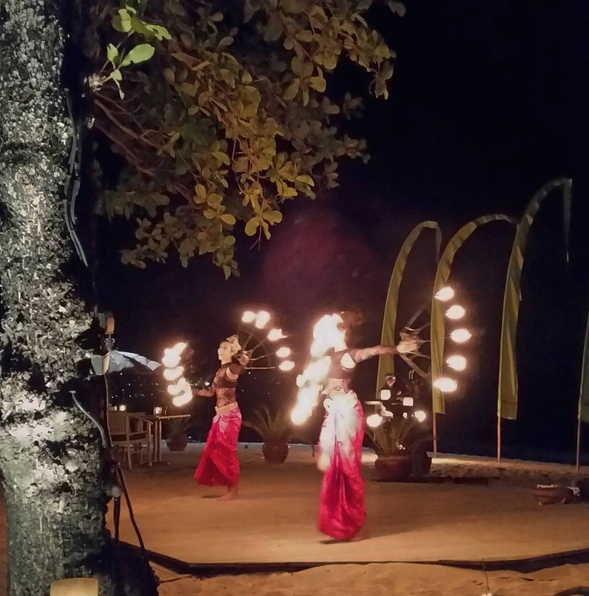 With offerings and statues scattered around the lush grounds, along with a massive common pool and beachfront dining, it was really a no brainer. 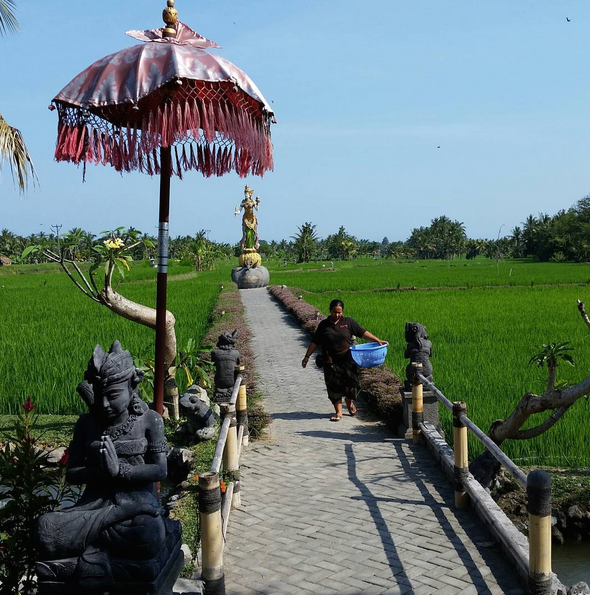 Next up, we took a quick (way too quick, but we were short on time) jaunt to Ubud, where we dined amid rice fields and visited the Ubud Market. I am still kicking myself for not having enough time to visit all the cool shops in Ubud, but my wallet is probably thanking me. When we ordered Smoked Fish, I’ll admit, I thought it would be smoked like Whitefish or Salmon, but it was more like Steamed Fish. 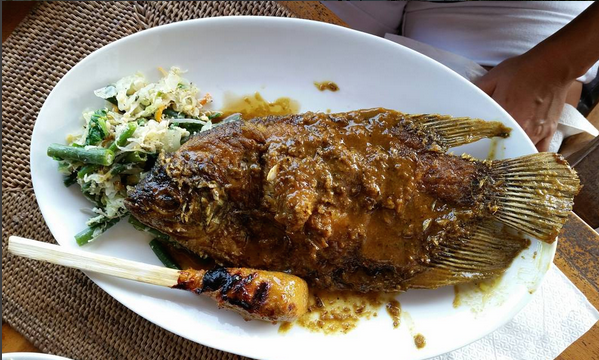 A tasty melange of garlic and subtle curry flavors rounded out this impressive looking snapper. But wait… I forgot to mention Monkey Forest in Ubud! How could I forget? This hanging forest meets monkey haven is an experience worth flying 20 hours to see. Monkeys and little monkey babies run wild and have no shame! You buy bananas at the entrance without realizing that once the monkeys see you they will jump on top of you and go, quite literally, bananas. This little mom and her baby stole my heart (I was out of bananas). 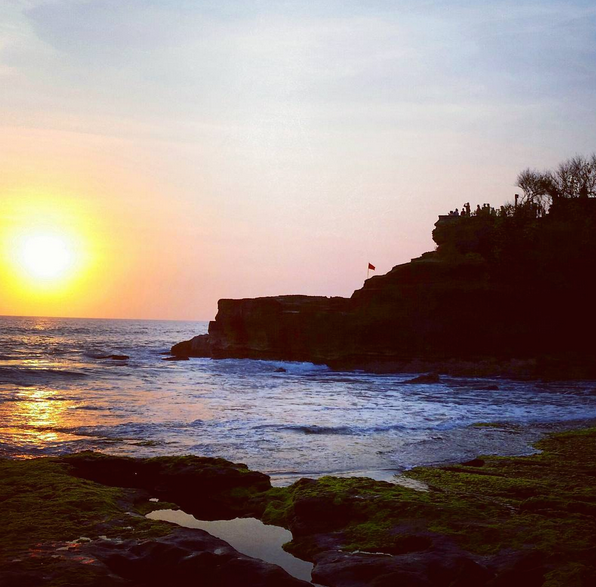 We finished our day trip with a stop at Tanah Lot, a Hindu temple sitting on a rock formation on the coast, along the beach. It was quite interesting in that it felt as if we had stepped back in time (complete with a Holy Snake you could pay a small donation to touch). That said, it was quite crowded which hampered the allure a bit. However, I did manage to capture one nice sunset, even if the actual temple view was obscured by too many tourists. I finished the outing off with a massage at the hotel and a promise to always make the most of life’s brief moments. Even if it means a very rushed weekend trip to Bali after a crazy turbulent flight. 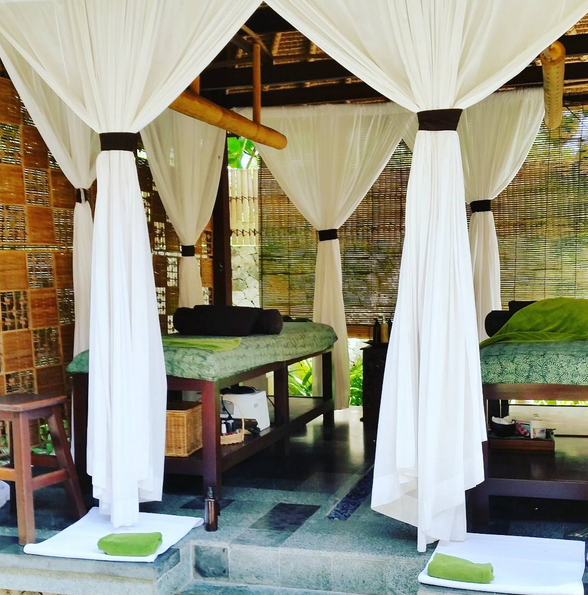 In this case, my 60 minute moments equalled a very powerful Balinese massage where I was covered in the most delicious smelling orange bergamot oil. 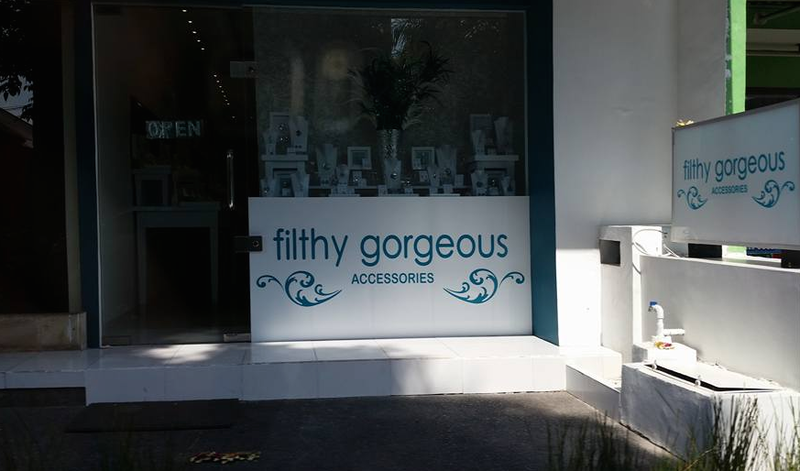 Because like life, and this storefront in Ubud, it’s filthy and it’s gorgeous and I wouldn’t have it any other way. 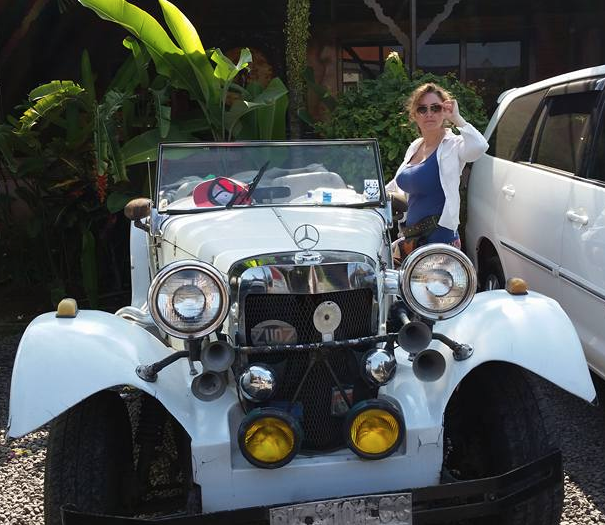 Passionate traveller, blogger, journalist, mother, and friend. Revis loves almost every type of food, but she won’t eat organs… or water chestnuts.